The Ryder Cup is faintly unhinged, in a good way. Europe's victories produce delirium. The reason, surely, is that people find it hard to believe anything in sport could go so perfectly, or that 12 people could work so well together. Such togetherness is not normal. Europe's Ryder Cup team are sport's best model for combining nations and pitting them against opponents with more money, bigger reputations, a grander array of Major titles. As Sergio Garcia said while Ian Poulter was pulling a postbox costume over his head (yes, Poulter always delivers): "People said this Ryder Cup was over before it began. They picked the wrong team." Europe had several advantages when 'le golf' began on Friday. The course was one. Its narrow fairways were part of the reason Europe extended a run of home wins to six. If home advantage helps, there is no doubting the iron will and passion of Europe's 12 - as individuals and as a collective. Alex Noren's 40-foot birdie putt to win the last match of the day against Bryson DeChambeau was symbolic of what Europe are. The Cup had long since been won. Yet Noren's stunner set off yet another pitch invasion by a team who are masters at rejoicing. Europe marmalised a team with nine Major winners. They consigned Phil Mickelson to a museum and sent Tiger Woods home without a single point, seven days after his resurrection in Atlanta. Francesco Molinari became the first European to go 5-0 in a Ryder Cup in the same year he won a Major, Tommy Fleetwood became a folk hero, Garcia justified his controversial captain's pick, Jon Rahm beat Woods in singles play and Thorbjorn Olesen wiped out Jordan Spieth 5&4. The rookies and the wild cards stepped up. Thomas Bjorn's captaincy was on point. And the leaders in the team did what Bjorn promised they would. They led. Everything he said on the day he picked Garcia ahead of Rafa Cabrera Bello turned out to be right. "I've always said 12 becomes one," Bjorn said back then. "A European Ryder Cup Team is 12 becoming one." Any coach could make that statement. Any captain can tell a team to stay united. But for Europe now it has become automatic. America were nibbling at Europe's lead yesterday, closing the gap to a single point when the onus fell on Rahm (rookie), Olesen (newbie), Molinari (Open champion) and Garcia (rock). All won their matches, in all cases against household names of American golf. This stopping of a potential rot was described by Rahm as "the best feeling of my life". Then he invoked Seve Ballesteros and his late grandfather. On the 18th green Poulter hugged his weeping son. America - who won handsomely at Hazeltine two years ago, it should be remembered - seem incapable of summoning the same passion. An American country club reserve hangs over them, as if deportment matters more than taking Europe on with heart and soul. "We've had this WhatsApp group that's just been one big kind of love-in," Rory McIlroy said. "There's a continuity on our side maybe the other one [America] doesn't have." This imbalance was apparent after America had taken a 3-0 lead on Friday morning but then lost eight consecutive matches. With momentum lost, many moped around this Paris course. When was the last time you saw one of Europe's players sulk? They can barely leave each other alone, with their bear-hugs and chest-bumps, their fervent mutual support. 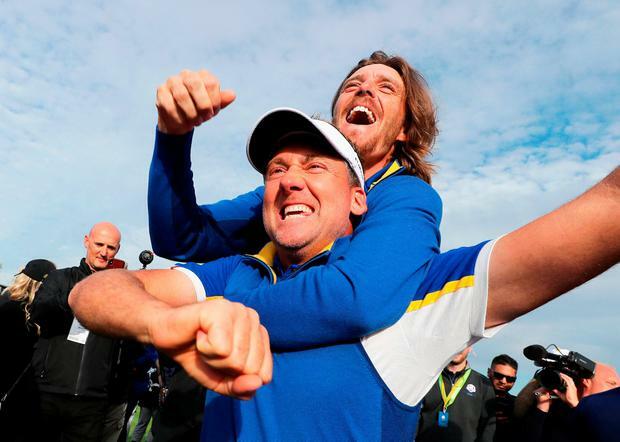 "They carry the torch for European Ryder Cup golf," Bjorn said. "They understand the history and what we're about." The crowd did their bit, sending several Americans into their shells. Le Golf National was on another level of boisterousness, with some of the shouting a touch disrespectful, though most was simply partisan in ways that demoralised Jim Furyk's team. To prepare for the Ryder Cup in Rome, the Americans might need to practise in the Colosseum. The listlessness of America's team, meanwhile, contrasts with Europe's view of the Ryder Cup as an almost holy calling. Garcia has had a farcically bad year but persuaded Bjorn he would be his usual self by the time he arrived in Paris. Poulter met Bjorn in the parking lot at the Augusta National Club in April. Bjorn said: "All he talked about was the Ryder Cup. You don't need to hear anything else from him. That's the heart and soul and everything that we are." That spirit burned in France's first Ryder Cup, where the middle order spotted a threat from wins by Justin Thomas, Webb Simpson and Tony Finau and knuckled down in the old European manner. Working as a blue swarm of buggies, helpers and motivators, they helped Rahm, Poulter and Garcia raise their performance levels and intensify their focus. These are the qualities of great teams: the ability to unite and fight, irrespective of the talent in the other corner. Woods, Dustin Johnson, Jordan Spieth, Rickie Fowler and Mickelson: all celebs, all beaten. As Justin Rose said, Europe never "dropped their guard". Europe's Ryder Cup winners revealed that captain Thomas Bjorn's promise to get a tattoo of the final score if they won helped motivate them on the way to victory.The Dane was universally praised by his players for the support team he assembled and the relaxed way in which he led them, but it was another piece of motivation which gave them that extra push, the players said. "You might all see - I don't know when it's going to get done, but we had some extra motivation this week to make sure we put our hands back on that trophy," Ian Poulter said. "As little or big as that number is going to be; it will be a very interesting number to see." Sergio Garcia asked if it would be a "number or an image" to which Poulter responded "the score". "We still have to work in the initials of the players," added Garcia. Rory McIlroy joked that "there could be a visit to a tattoo parlour coming soon for Mr Bjørn on his head." Justin Rose added that the bald Dane had "plenty of real estate" for a tattoo artist to work with on his scalp but Bjorn himself suggested any ink would be somewhere far more private. "Let me put it this way, it's going to go on a part that only Grace will see," he said. "I might have to send them a picture, I guess. The worst decision I made all week."